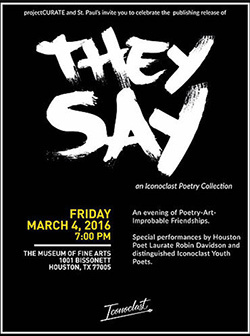 Ever considered the logistics and positives of “improbable friendships?” On March 4, inner city students, families, teachers, administrators, artistic sorts and city officials will be gathering together to celebrate student-authored poetry. In recent months the Iconoclast program has been nurturing this “new community” which provides a unique sense of support and encouragement for almost 200 students from five of Houston’s public schools and two juvenile detention centers. This poetry program, partially sponsored by St. Paul’s UMC, Houston and the Texas Conference Center for Missional Excellence, is experiencing life-changing success by teaching students to express themselves in positive ways. 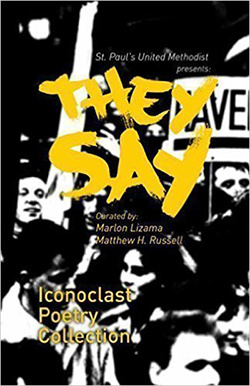 Iconoclast is one of the programs of ProjectCURATE (Center for Urban Reconciliation and Theological Education) which exists to facilitate new expressions of kinship, compassion and solidarity that fosters inclusive diversity. So far, Iconoclast is a promising strategy to block the school-to-prison pipeline that often haunts impoverished students who miss school and often get tangled up in a downward spiral. While many of these students struggle with grades and negative behavior, they are finding a sense of belonging, empowerment and new ways of addressing their personal experiences through poetry. “The goal of the Iconoclast program is to help them imagine a new future and then create definitive pathways towards new possibilities,” Matt shares.